Cre8ive Toolkit is the systemised collection of 8 Modules addressed to train the trainers engaged with marginalised young adults. Cre8ive Train-the-Trainer Curriculum, through its 8 Modules, can support educators and youth workers in inclusive educational activities exploiting the power of the creativity and the cultural expression of arts and new digital technologies. The Toolkit aims to facilitate the self-directed learning of multipliers and the pilots realised in Romania, Bulgaria, Portugal, Cyprus, Ireland, Greece and Italy were exploited to test and improve this final product. Trainers and youth workers of seven EU countries were engaged in the pilots and we are thankful for their feedback, and suggestions for improving the Educational Resources targeted to sustain learners and young people at risk of social marginalisation, to support the acquisition of social and civic competence, digital competence, cultural awareness and expression, literacy, numeracy, entrepreneurship and critical thinking. Cre8ive Toolkit consists of 8 Modules related to creative educational methods, including 21 educational resources; useful links to external resources to learn more about each method; and assessment instructions sheets. Methods are organised along the 8 core competences, designed to guide you in identifying the tools that best serve your purposes in your learning environment. The Knowledge Management Repository of Cr8ive Toolkit consists of the collection of selected educational tools, inside and outside the partnership, useful to better enjoy these creative practices. The Cre8ive Modules related to: the Induction, the Facilitation practices and the Creative Methods are organised into the 8 key competences that are fundamental for each individual in a knowledge-based society, and specifically for young people as means to equip them to the adult life, valorising their potentials for the further learning and the working life. The development of the Curriculum took into account the results of the Research conducted among youth workers and trainers about the learning needs analysis of marginalised young people. In Annex 2 you can read the infographic of the needs analysis carried out by partners in each country about the key competences needed among marginalised young people. The aim of the Curriculum is to support youth workers and adult education professionals working with disadvantaged youth to use the full range of creative disciplines to build key competences. Before starting the train the trainers programme, we invite you to read the expected Learning Outcomes for each Module. The learning outcomes, divided into knowledge, skills and competences, are the representation of what trainers and youth workers will be able to perform and produce after the completion of CRE8IVE train the trainers’ modules. The curriculum is comprised of 8 Modules in total. These are divided into 2 core Modules namely Induction to Pedagogy and Facilitation and Conflict and 6 elective Modules namely: Drama, Storytelling, Music, Photography, Film Production and Digital Media. Some online utilities are available for users during the project and some of them also after its end, to keep the community of practitioners and multipliers who will benefits from Cre8ive project. 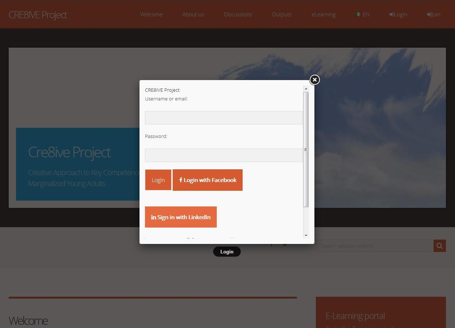 To entry the e-Learning Platform and the Toolbox a simply Registration Form should be compiled to have the free access to the Train The Trainers Curriculum. Further news can be found on the Project Newsletters, and you can take part to other participatory spaces on Facebook and LinkedIn. Enjoy your CRE8IVE learning and direct testing!